During the two and a half years we spent building our Locost, we used to daydream regularly about what it was going to be like to have a Locost. We imagined all of the things we'd get to do with the car, like the first drive, first trip to the coffee shop, first long drive, first drive with a car club, first Cars & Coffee meet, first commute. There seemed to be no end of firsts. Not that we looked very far ahead. We actually had no idea the car would stay together this long. Now, almost a year and half later, we've taken the Locost everywhere and done just about everything we ever wanted to do with it. Almost. 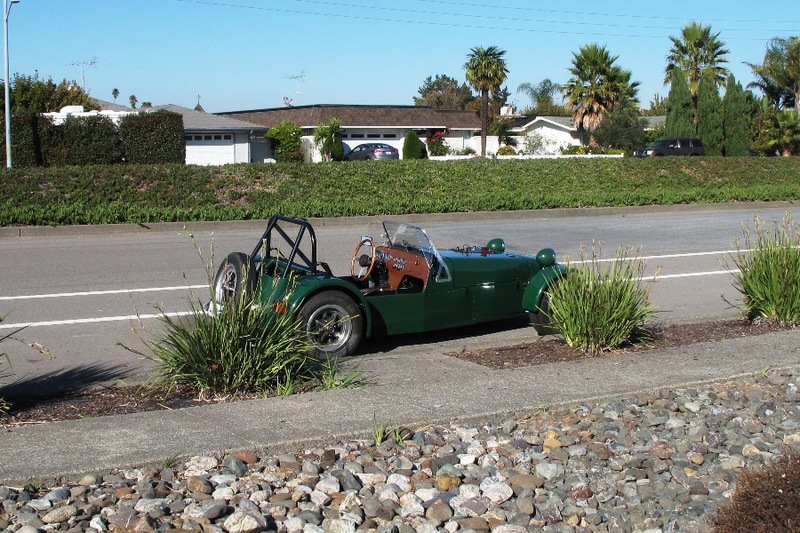 The car is still a blast to drive, and we still get waves and thumbs up from passersby as if they'd never seen a Locost before. 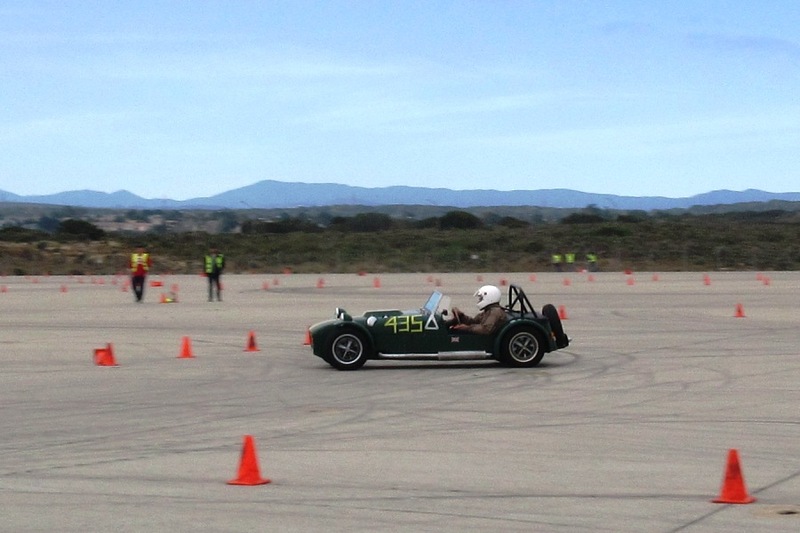 In the last year and a half we've enjoyed just about every one of our early daydreams, but there was still one first we hadn't yet accomplished, and so a few weeks ago we entered our Locost into its first motorsports competition, an autocross hosted by the Golden Gate Lotus Club. 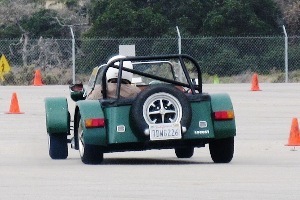 Known hereabouts as the GGLC, the local Lotus club hosts a series of autocrosses at the Marina airport near Monterey, and we thought that would be a good place to test the waters. Or asphalt. So we grabbed our helmet and hopped in the car and headed for the coast at 5:00 a.m. in the freezing cold, and when we got to the event around eight it was slightly colder. California's Monterey Peninsula is not a warm place this time of year. Or any time of year. Although it can often look that way in postcard photos. 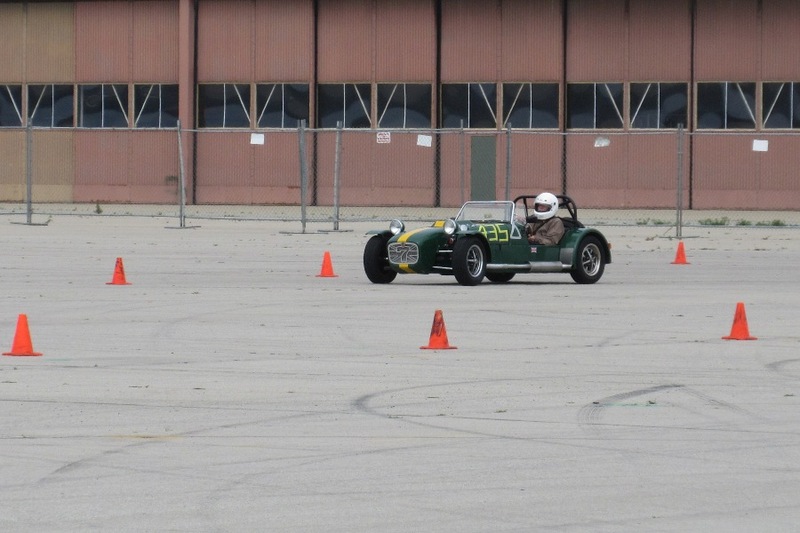 Back in its day, with its light weight, low CG, and nimble handling, our Locost would have been a highly competitive autocross car. Unfortunately, those days are long gone. Today you need super-sticky tires and a few hundred horsepower if you plan to vie for the top time of day prize. Some people have built Locosts like that, but we didn't. With our all-season radials and tired 18V M.G. 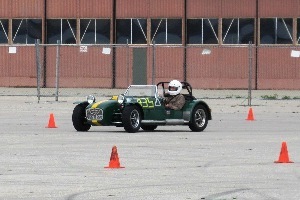 engine, we were able to post times that didn't completely embarrass us, but partly did. 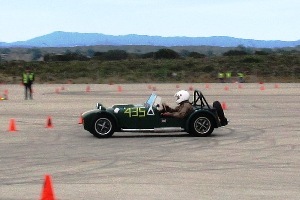 The good news is, the car was a blast to drive flat out. It felt like we were flying. Even better, nothing broke. We flogged the engine in second gear the whole time, paying no attention to the tach as we mashed the throttle against our makeshift pedal stop. 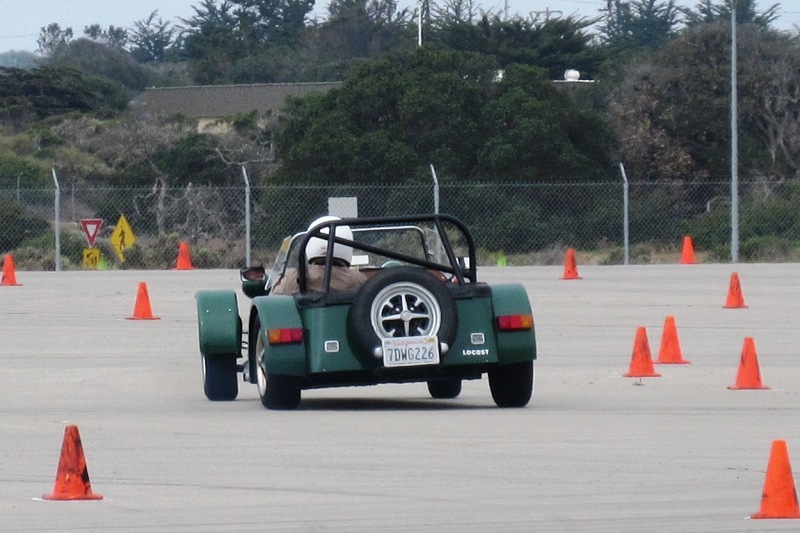 The brakes were also never seriously taxed, our usual method for slowing down consisting of pitching the car sideways into turns and letting tire scrub do the rest. In the Locost, all of the steering is done before the turn. When the back end comes out, and it will, you immediately straighten the wheel and mash the throttle to hold the line. It works almost every time. Tail-out may not actually be the fastest way around a turn, but we think it's as fast as anything else. I remember back in the seventies seeing a couple of pictures in an old Road & Track magazine, a side-by-side comparison of Mark Donohue and Jody Scheckter taking the same corner in their Formula One cars. Donohue had the classic smooth line with the car under complete control. Scheckter had the back end out, the car scrambling for traction. The interesting thing about the comparison was their lap times. Identical. Because of this we stubbornly and unrealistically refuse to believe there's anything wrong with our driving technique. We could probably go faster with stickier tires, but stickier tires would be wider, which would involve a lot of work to increase the rear track on the car, or at least wheel spacers, which wouldn't be as much work but would cost money. So would tires. And wheels. 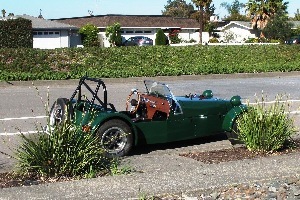 And an anti-roll bar or two. If we were in this for the glory of top time of day, and I'm not saying we aren't, it might be worth the investment. But then we'd also have to start thinking about a new engine, or at least rebuilding the current one to generate a full 100 horsepower and spin to redline without throwing a bearing. Which it might do now but we're reluctant to look at the tach when the engine is screaming like a banshee. Unfortunately, our engine is working well enough right now that we can't really justify a full rebuild, although we're thinking that with a little neglect, some proper overrevving, and running low on oil a few times, we might be able to hasten its demise. The only other thing we're considering replacing anytime soon is the exhaust system. Not the whole system. That would obviously take too long and cost too much money. 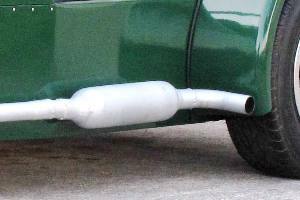 And besides, we're actually pretty happy with our current exhaust system, which does the job of routing deadly exhaust fumes harmlessly to the side of the car as well as could be expected, and it's only broken a few times. 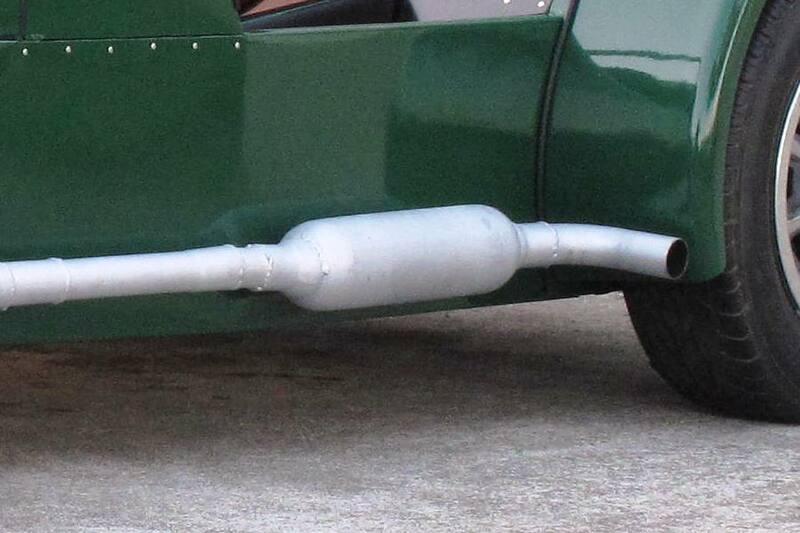 So actually the only thing we're thinking about replacing is the muffler. Our current muffler has served us well, despite its crude looks and deafening exhaust note, which is fine at cruise, but we've found that you can't always cruise, sometimes you have to speed up. Which is where the problem lies. We think a 24" muffler would be more effective than our tiny 15" muffler, but that's only a guess, and assumes we could figure out a way to splice the larger muffler into our existing system. Which probably involves some cutting and welding, which we think we still remember how to do, but as always no guarantees. In the meantime, we're continuing to drive the car almost daily, adding about a thousand miles a month, at least in the spring and summer. We're currently just over the 12,000 mile mark, and starting to think about that first major servicing, although we're not entirely sure what that entails. Probably changing the transmission and rear axle oil, and maybe flushing the cooling system. Of course back in our building days we never daydreamed aboout doing any of that, because as noted earlier we never expected the car to last this long. I suppose as always we'll figure it out.